As you prepare to celebrate this holiday season, please consider including Toby's Foundation in your year-end giving. Blood samples and funds are still needed to support the research. 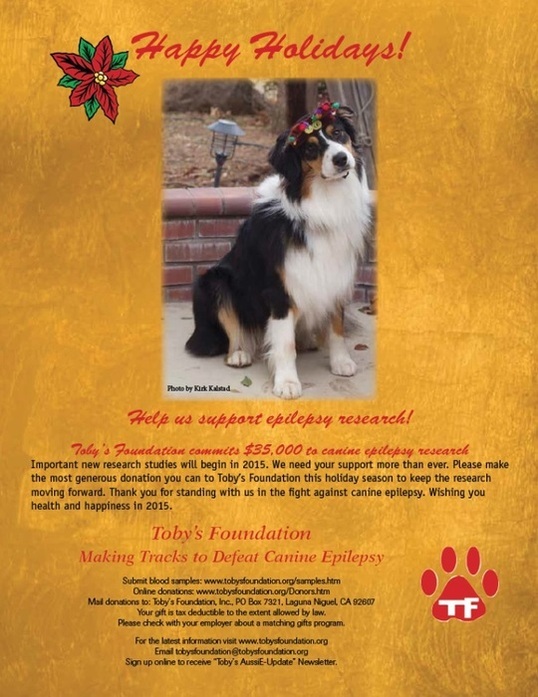 Toby’s Foundation has committed $35,000 to fund important new epilepsy research in 2015. Help us support canine epilepsy research! Please make the most generous donation you can to Toby’s Foundation this holiday season to keep the research moving forward. Blood samples from affected dogs are needed. For information to submit a blood sample from your dog go to www.tobysfoundation.org/samples.html. Thank you for standing with us in the fight against canine epilepsy. Your support and generosity are deeply appreciated and show your concern and love for our precious dogs and your desire to stop canine epilepsy. We are very thankful for you! Recruitment is open for dogs with epilepsy that are being treated with Keppra XR (levetiracetam extended release)) and Phenobarbital (group I) Keppra XR and Zonisamide (Zonegran) (group II) , or Keppra XR alone (group III) for a Pharmacokinetic study. This study is being conducted at North Carolina State University-College of Veterinary Medicine, under the direction of Dr. Karen Munana, DVM, DACVIM (Neurology). If your dog has been diagnosed with epilepsy, and is receiving the drugs listed above in any of the 3 groups listed, we are interested in sampling your pet to determine how Keppra XR interacts with the other anticonvulsants through sequential blood sampling in a one-day study. All blood levels will be provided to the owners at no-charge. If you are interested in more information regarding this project, or to see if your pet qualifies, please contact Julie Nettifee janettif@ncsu.edu or 919-513-6812. If unable to travel to NC State, arrangements can be made in most cases to have sampling performed by your referring veterinarian.